Why most liquids don't quench your thirst. Surface Tension Examples – Why it’s important. Small insects such as the water strider can walk on water because their weight is not enough to penetrate the surface. If carefully placed on the surface, a small needle can be made to float on the surface of water even though it is several times as dense as water. If the surface is agitated to break up the surface tension, then needle will quickly sink. Common tent materials are somewhat rainproof in that the surface tension of water will bridge the pores in the finely woven material. But if you touch the tent material with your finger, you break the surface tension and the rain will drip through. Help the cleaning of clothes by lowering the surface tension of the water so that it more readily soaks into pores and soiled areas. The major reason for using hot water for washing is that its surface tension is lower and it is a better wetting agent. But if the detergent lowers the surface tension, the heating may be unneccessary. Disinfectants are usually solutions of low surface tension. This allow them to spread out on the cell walls of bacteria and disrupt them. One such disinfectant, S.T.37, has a name which points to its low surface tension compared to the 72 dynes/cm for water. Surface tension determines whether liquids penetrate and absorb or simply run off. Structured water from a Water’s Edge system will typically range from 38 to 42 dynes. It can hydrate much better than unconditioned water. It’s wetter water. 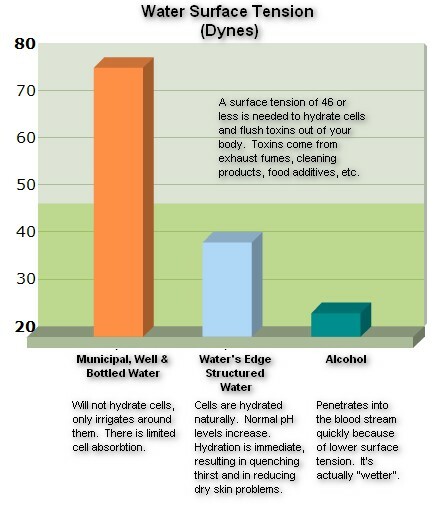 This is why structured water can quench your thirst where other liquids can’t. Even when showering or bathing, structured water will be available to hydrate and be utilized by the body. The Water’s Edge System is revolutionary science! It turns mediocre water supply sources into “live, structured, and energized” water to balance your frequencies, optimizing body hydration and health. Water tastes “spring-fresh and alive”. Subconsciously you will want to drink more water because it’s naturally good for you. Buying expensive bottled water and lugging it home will be a thing of the past!